I don’t remember what age I was when my Aunt Linda and Uncle Mike moved down to the valley and into a storybook cottage of a house. I was young enough that the swing hanging from the massive poplars in front was a real selling point for me. There was a back porch, a bathroom with two entrances and a kitchen that seemed to hug the dining room. I have so many warm memories of that home and the hours spent in it. It helped that Aunt Linda is a spectacular hostess and homemaker in the real sense of the word. She taught by example how to go all out and how that makes people feel special. A family dinner would mean goblets and name cards and a beautiful centerpiece. I had my very first slice of red velvet cake, baked in the shape of a heart, seated at her table. Life was worth celebrating and celebrations should be big! She also taught me how to decorate the corners. For each holiday and season, she spread little touches throughout her home. Christmas meant festive towels and wintery vignettes- even in the bathroom. It made sense to me, the way that a celebration would permeate everything. 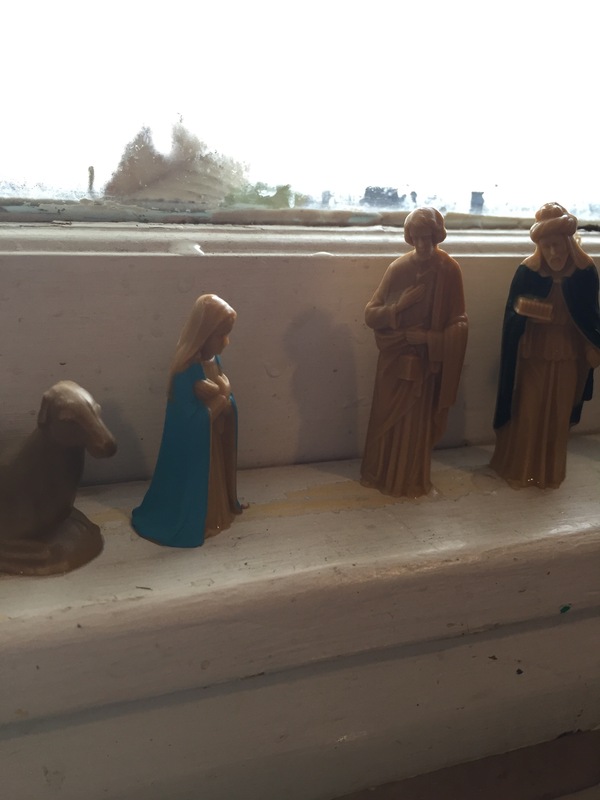 I thought of Aunt Linda when I cleared the window sill above my sink to make room for my favorite nativity. Was it necessary? Most assuredly not. But helpful? Yes! 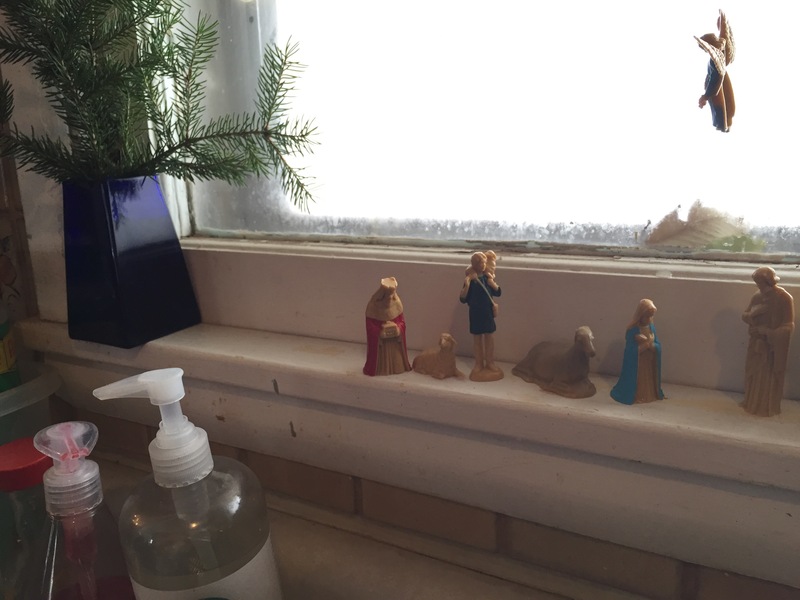 Finding myself at the sink- as I often am- I am reminded to reflect on the expectation of the season. It brings me so much joy to have such a festive surprise in the midst of the ordinary. That’s what the seasons are about, after all. A break in the midst of ordinary time, they call us to clear away what is normally in view, to make room for the Lord. We fill up our lives with clutter and noise and the special seasons ask us to stop and take stock. To set up a space for Christ to come in and make our hearts his home. Do we extend him that hospitality? True, decorating my kitchen or bathroom or hanging a wreath on the office door doesn’t do that but it does open my heart to welcoming his pervasive presence. And the joy that comes in embracing the season- well it’s just a shadow of what is to come through him! We’re still working on the decor up in here, but we are relishing the preparation in each and every corner even as we clear the corners of our hearts, “preparing the way of the Lord.” ‘Tis the season! I like to involve all the senses in the season. This podcast of sermons from the Cathedral in Bismark is challenging my heart and soul. We know Monsignor Richter but Fr. Johnson and Bishop Kagan are heavy hitters, too, and leave me pondering their words at the sink every day. Good thing I like my view! Your writings here bring back memories of your “Tea Party” birthday, & Croquet game in the front yard! Always enjoyed that “little house” I was privileged to live in for awhile! Built by my grandparents in 1916 and sold in 2014 after my aunt (of same family) moved to her “Heavenly Home”! Is truly amazing & a blessing to reflect back and think that in one way or another I had contection with people I knew & loved in a “Little House” by the roadside for nearly 100 years! More importantly though is that I had a Godly heritage & the Hope of a Heavenly Home!